In AW2017, Kose had released new lotions under Cosme Decorte, Cosme Decorte AQ Lotion, and AQ Lotion ER, and AQ Toning Lotion a.
I (Cherry) got samples of Cosme Decorte AQ Lotion ER, it satisfied me, and bought AQ Lotion ER for my self. Let me share with you my personal review of this product of AQ Lotion ER. There are three lotions, as I had mentioned. The difference of AQ Lotion and AQ Lotion ER are, simply ER is extra moisture type. For my skin type, ER is better, it is coming to drier and colder really soon in here. 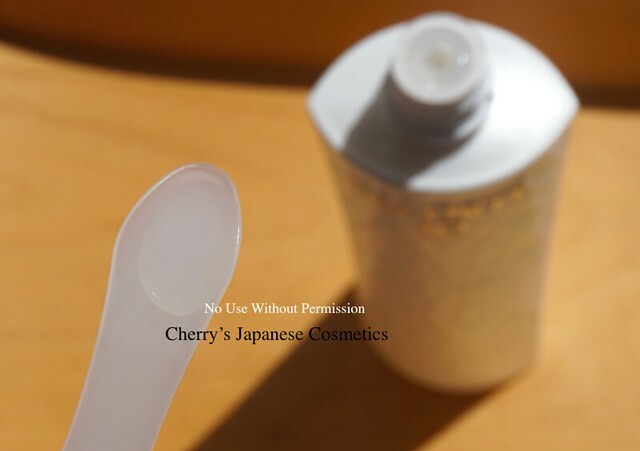 The AQ Torning Lotion a is not a moisturizer but a toner, using before of your makeup. In person, I am not so much understand the reason to use this product. 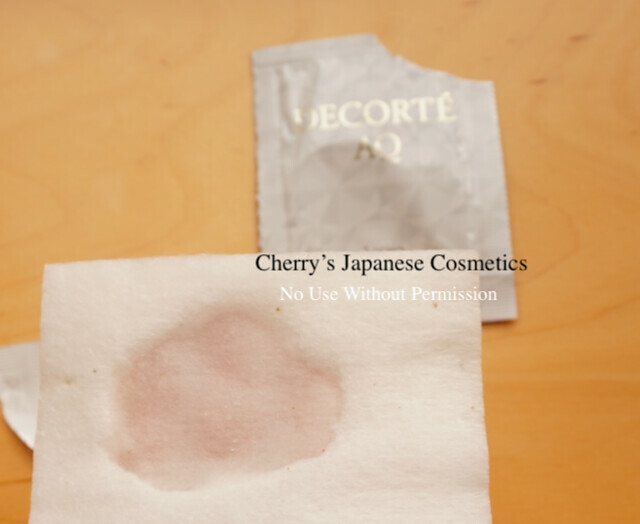 If you are familiar with Albion or Cosme Decorte Skincare method, their recommended way is emulsion/ milk first, and the lotion second. I may tell you later, this lotion is super moisturized my skin well, in some busy morning, I use this lotion only. How do I feel to use? The perfume of this lotion is the same as AQ Emulsion, it is floral but posh. I love it. The texture is sticky, as AQMW Repair Lotion too. It moisturizes my skin pretty well, so in daytime or busy morning, I often use this lotion and oil only. Sometimes I feel sting by using lotions or emulsions. Seems there are ethanol, but I did not feel anything irritation. For me, this is quite important factor. 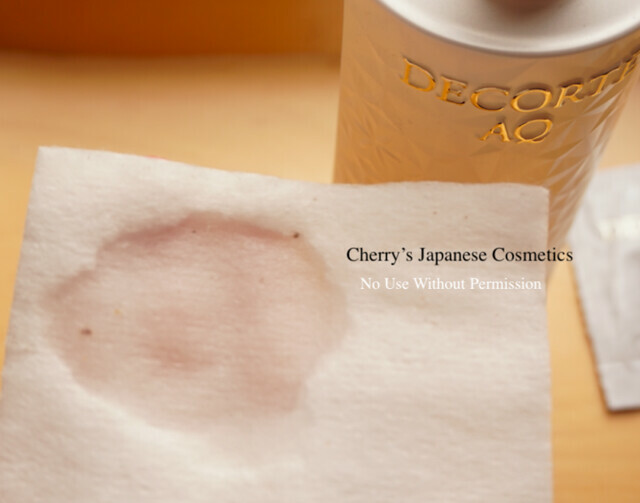 Cosme Decorte recommends to use cotton and apply it with tapping. But I do not recommend to tapping if you have dry skin (like me). Because tapping is for oily skin. Tapping is to make your skin “tighten”. I applied it on my skin by my hands with wrapping my face. Frankly to say, this lotion did not moist my skin quickly. 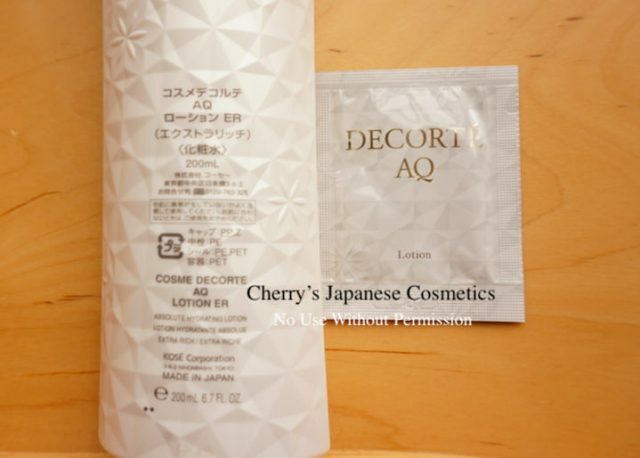 Difference between Cosme Decorte AQ Lotion and this Lotion ER? 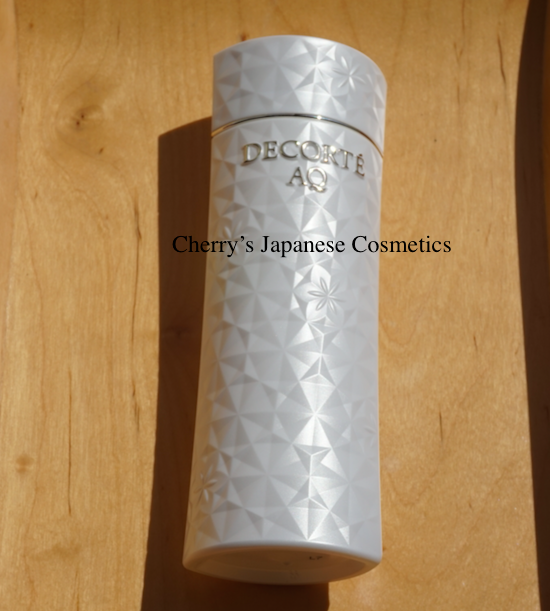 Finally I got a sample of Cosme Decorte AQ Lotion. And this ER is left a little bit. Let me compare them. I took this AQ Lotion whole of a package on the cotton. With seeing the quantity of AQ Lotion on the cotton, I took almost the same quantity of AQ Lotion ER. And apply them hand of my faces each. In this SS2018, they also releasing Cosme Decoete AQ Whitening line. I got small bottles of them. 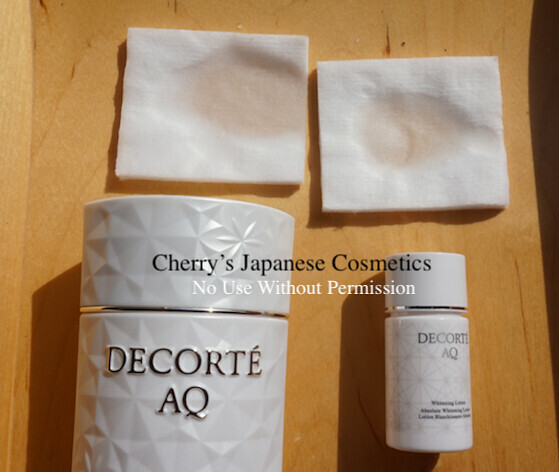 Please let me compare my Cosme Decorte AQ Lotion ER and Cosme Decorte AQ Whitening Lotion. The “whitening” (brightening) factor is kojic acid. 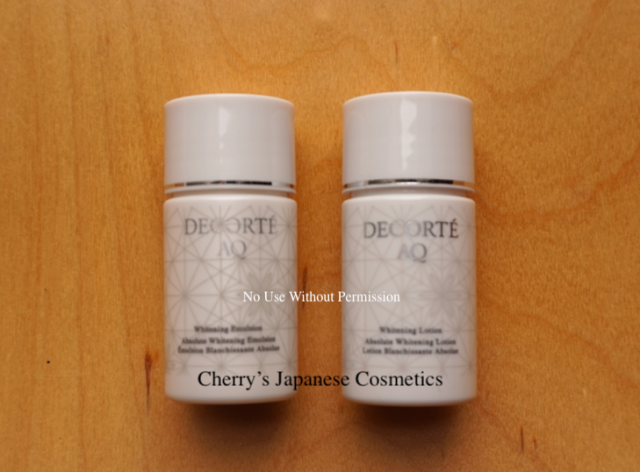 I often feel sting the products with kojic acid, but fortunately, as the same as Cosme Decorte AQ Whitening Emulsion, I did not feel anything irritation with this AQ Whitening Lotion. The texture is different. AQ Whitening Lotion is more smoother and lighter than AQ Lotion ER. Both are a little bit sticky, but Whitening is much lighter. Totally to say, this lotion is no sting, good scent, and moist well. Nice product! And if you want to have Cosme Decorte AQMW Repair Lotion, as of Sep 2017, it is not discontinued. We have stopped to deal on the store, but we can do that as custom order.